Every once in a while, I come across a writer that will tell me a story exactly as I wish it to be told to me; even if I didn't yet know how at the time. This is one of those instances. It's quite well known now, or at least I hope it is, that King Leopold II of the Belgians orchestrated a system of forced labor in his own swath of the Congo from the 1890's til his death, with death & mutilation as the order of the day. But the author doesn't just drop us down into this story at the moment Leopold acquires the Congo for himself. We're first introduced to the Congo in the 1440s and brought gently along until we're made to understand the history of the region & the role early European powers played in the continent. With that, Leopold appears more and more a man of his time. Perhaps, the most astounding fact of his total disregard for & systematic destruction of an estimated 10 million people, was that he was one man who was solely responsible for wreaking this havoc & reaping the considerable profits. Governments, maybe, but one man ?! 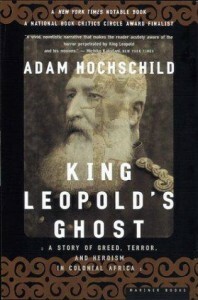 But this isn’t just a history of Leopold’s greed & slick public relations machinations. It’s also a testament of the suffering of the native Congolese, which just as it seemed to end with his death, continued on for years and decades to come. And it’s the stories of the numerous people who tried to bring the attention of the masses & powers that be, to exactly what was going on in the Congo. Said to be one of the biggest worldwide protest movements, the call to end slavery in the Congo went global in the last 19th and early 20th century and yet, would most people even know this today? This is one of the central questions the author poses. What did the Belgians think of this part of their history? Is it taught in school? Is King Leopold II of the Belgians seen as anything other than a philanthropic monarch? It’s also, perhaps most importantly, a lesson in human history itself. As this story draws to a close, we follow the timeline of the Congo as it continues to evolve; a Belgian colony then an ‘independent’ nation under a string of despots; and it seemed to spell out to me that the Congo is just another event linking the previous atrocity in our recollection to the next. Ever so predictable is the government’s reaction; deny where you can, hide what you will & hope nobody notices. Until a more honest appreciation of our history if taken, it seems to this reader that we’ll continue to see the atrocities lined up, side by side. But until them, this read will hold your attention & serve as a cautionary tale, one among many, about wearing blinders when it comes to history.